- Diane "being a jerk"
- "...Save Rhea and Rick?!" "And everyone else." "Whatever." - "Nanase's the coolest person I've ever met!" - "At least, I assume (Diane's crush) is platonic." You know what? I've gone and confused even myself. I've been wanting to touch on this "default" issue for a very long time now. From a story persepective, specifically in regard to Susan, but also from a general "I have a bone to pick with the world" perspective. Aside from the encouraging people to disregard feelings they might have, I think a lot of situations that could simply be cases of "I find this person attractive, no big" can escalate into full on identity crisis because of it. 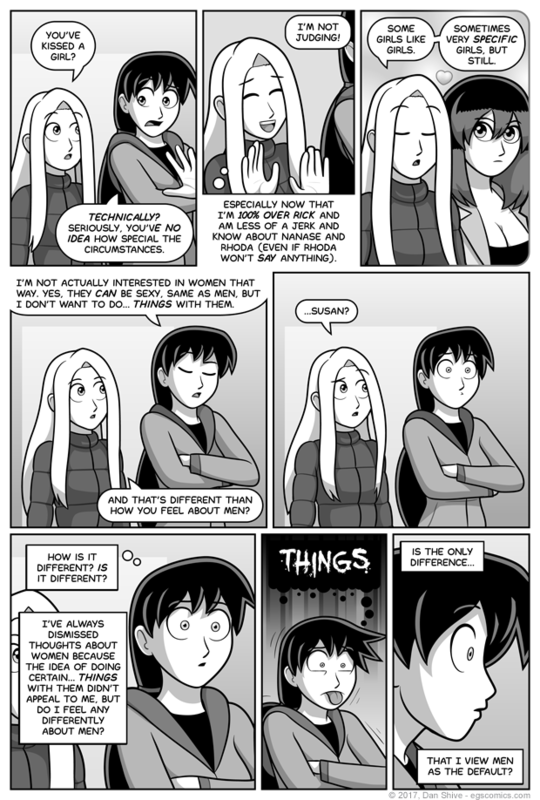 Granted, there are still plenty of feelings to sort out without being concerned about who we're "supposed" to be attracted to, and Susan's still sorting out hers. Diane was introduced with no intention of having ANY connection with Susan. After many people pointed out the resemblance, however, and I ultimately decided I didn't have much of a direction for her as things were, I began to scheme and plot about how they could be connected. I point this out because, YE GODS, I would NOT have had Diane call Justin a "defective male" if this had all been planned that far in advance. This is one of the reasons for the character of Rick (another is I just generally like Rick and Elijah). The intended implication is that Diane had a major thing for Rick, a crush going back many, many years, and she responded poorly when she learned of Rick being gay. This does not excuse her behavior, this does not make it okay, she still owes Justin an apology or several, BUT I wanted there to be a reason behind her behavior beyond her just being that much of a jerk, and I wanted it to be something she'd look back on with regret. Still, y'know, she should say something to Justin. Just saying. Seriously, Rhoda, Diane knows. You don't have to hide it.